BERLIN (AP) — One week is all it took for Bayern Munich and Borussia Dortmund to, essentially, switch places. Bayern is sliding into its first crisis under coach Niko Kovac after three games without a win, while Dortmund has taken the Bundesliga lead and maintained its unbeaten start with a 3-0 win over Monaco in the Champions League. Bayern had started the season with seven wins in all competitions, but the team looks unsettled by the latest setbacks. First, Augsburg scored late to earn a draw in Munich. Then Hertha Berlin handed the team its first loss. And on Tuesday, Ajax held Bayern to a draw in the Champions League. The Dutch team even could have won after outplaying the home side for long periods and hitting the crossbar in injury time. "I have to process it first," Kovac said after the game. "I'm not the only one that's surprised, many are. You couldn't have expected it given the form we were in." It's been a year since Bayern last had three games without a win. That was under former coach Carlo Ancelotti and interim coach Willy Sagnol. "I know the gravity of the situation, that we haven't won in three games," Kovac said. "We have to concentrate on the essentials again." After starting well against Ajax with Mats Hummels scoring an early goal, Bayern failed to control the game and allowed the visiting side to come back after displaying uncharacteristic uncertainty. The defense looks shaky at times and the forwards are no longer ruthless going forward. "The way we've slipped a bit, we have to get back out of it," Bayern forward Thomas Mueller said with an eye on the team's home game against Borussia Moenchengladbach on Saturday. Bayern teammate Joshua Kimmich agreed. "We have to get back to dominating opponents, to cutting out these mistakes, so the understanding and self-confidence comes back," Kimmich said. Bayern's somber mood is made worse by Dortmund's resurgence under Lucien Favre. Dortmund, which leads Bayern by one point in the standings, seems to be improving game after game. 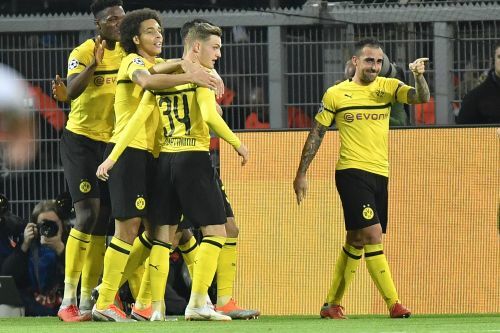 After routing Nuremberg 7-0 last week, Dortmund came from two goals down at halftime to beat Bayer Leverkusen 4-2, and Wednesday's win over Monaco continued the trend. Dortmund's young players in particular appear to be benefiting from Favre's meticulous approach. Eighteen-year-old Jadon Sancho has one goal and seven assists in nine games for Dortmund this season, while 20-year-old Jacob Bruun Larsen scored in his Champions League debut on Wednesday. New signing Paco Alcacer also appears to be settling in at the club with three goals in two Bundesliga appearances and another in the Champions League in his first start Wednesday. "His class is not in question but the guy still needs time," Dortmund captain Marco Reus said of the former Barcelona forward. "After the international break, when he has the right fitness, we can expect more."